In 2015, Westbury Packaging began a new partnership with Naturisimo, the UK’s leading online natural, organic beauty & wellness retailer. The aim was to design a new range of bespoke packaging for their customers who seek an eco-friendly and sustainable lifestyle. After a year of collaboration and discussions, we are pleased to announce the new packaging will come off the production line this week. Since 2002, Naturisimo has offered an easy and convenient way for consumers to discover clean, clever, contemporary beauty and wellbeing products that deliver real results. Renowned for their strict criteria on ingredients and suppliers, Westbury Packaging are very proud to have been chosen as their packaging partner. 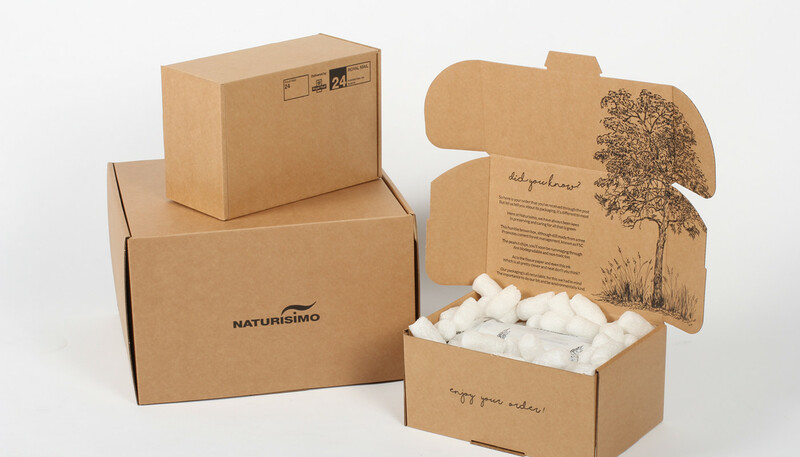 When the relationship started in 2015, Naturisimo were using a similar format of packaging to the new range, but in a lesser grade material and very basic print with no integrated brand messaging. Naturisimo were seeking advice and guidance on how to position their product as professional, but also appeal to their natural & organic customer base. They wanted to show that not only were the products they sold of the highest quality, but the entire customer experience was well thought through from the moment their order was received and packed for delivery. Every customer point had to convey the brand message about living a natural and organic lifestyle and the importance of environmentally friendly packaging. Westbury Packaging already work for a number of brands supplying luxury goods such as Mulberry and Jigsaw, where the customer experience is of the utmost importance. The idea of the packaging designed for Naturisimo was very similar. Westbury & Naturisimo went through various suggestions of environmentally-friendly material and different print ideas such as pre-print flood coated sheet, before settling on the design. The outer box is designed primarily to serve the shipping/postal requirement but when the customer opens their order, there is the big “reveal”. Printed on the inside is a simple but powerful poem for the customer to read. The poem was written about their environmentally-friendly packaging, next to a sketch of a tree which was created by the in-house creative team at Naturisimo to incorporate an element of nature.